You’re all invited to the Chapter 25 Christmas party. That’s right, a Christmas party! It’s almost that time of the year again and I want to be the first to invite you to a party and wish you a Merry Christmas. Ho, ho, ho, bah humbug. For those of you who made it to last years party, you know the routine, but for those of you who didn’t, here is how it works. We (plus spouse, friend or family members) will meet between 2 and 3:30PM at the American Wings museum at Anoka Airport for a tour. After the tour we will head across the field to Dan Carroll’s hangar for our party. If you can’t make it to the museum, you can head straight to Dan’s as he should be ready for us after 2PM. See the map on page 8 for directions. Members with last names starting with A-H can bring a beverage to share. i.e. wine, pop, water, egg nog, etc… Members with last names beginning I-Z can bring food to share. I’ve got the slab of smoked salmon from Alaska ready to go. The tour at the American Wings Museum has been lined up by Dale Johnson. The replica of the 1903 Wright Flyer that was built by Dale and Steve Adkins will be on display, plus WWI, WWII and Korean war airplanes. An original 1909 bi-plane that was built in Minnesota and another 15 to 20 airplanes will be there for us to look at. There will be a drawing after the tour for a ride on the 1903 Wright Flyer. Yah right! Keep in mind, we will not have a December monthly meeting on the third Wednesday as the Christmas party will take the place of the meeting. I hope you will make it to our meeting this Wed. at Washburn High. We will elect officers for 2006, so please bring two forms of I.D. and a current passport. Just kidding. If you need an absentee ballot, please call FEMA as they are now experts on absenteeism. While at Washburn, Peter Denny will show us the progress made on the Sonex since our last meeting there. 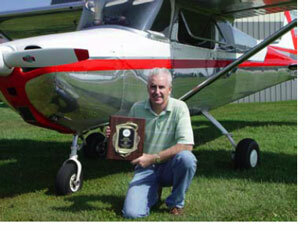 Peter’s current students are new to aircraft building so have not done a great deal of work on the airplane this fall. Peter has spent two months getting them up to speed. Most of the kids are now up to the challenge and Peter would like chapter members to stop by during the week and help them build. The class is now being held in the afternoon from 2-3PM. Our banquet speaker, Mr. Ken Wofford (the Tuskegee Airman), has been to Washburn H.S. and talked to Peter’s students since our banquet. By now you should have received your invoice for 2006 dues. Please take a few minutes to fill it out and send it back to Ron, the sooner the better. We will be publishing a new chapter roster for 2006, so we need the information now. Thanks to Ron Oehler for re-working the form ( “you know who” kept asking for changes) and for printing and stuffing the envelopes. Ron had 19 responses on just one day last week, so keep up the good response!